TORONTO, ON Oct 31, 2013 – The National Crowdfunding Association of Canada (NCFA Canada) is excited to announce today that Daryl Hatton, founder and CEO of FundRazr, and Bret Conkin, CMO of FundRazr, have joined the Association’s Crowdfunding Ambassadors Program. In 2013 FundRazr was awarded a Technology Innovation Award as Most Promising Startup by the BC Technology Industry Association. FundRazr was also included in the Profit Magazine Hot 50 as one of the fastest growing startups across all industries in Canada. Founder and CEO of FundRazr, Daryl has over 30 years of software industry experience and has founded multiple start-ups and helped bring one, Optio, to a successful NASDAQ IPO in 1999. He actively serves as board member or advisor to multiple other start-ups in BC and Silicon Valley. The CMO of FundRazr, Bret has 25 years of software, start-up and consumer brand expertise including roles with Procter & Gamble and BC Lottery Corp. Bret has founded and collaborated on several technology start-ups and been a frequent speaker, service provider or advisor to top BC business organizations including: Small Business BC, New Ventures BC, BC Innovation Council, Vancouver Enterprise Forum and Angel Forum. 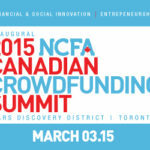 The National Crowdfunding Association of Canada (NCFA Canada) is a newly formed cross-Canada non-profit with the mandate to be inclusive in providing education, advocacy and awareness in the emerging crowdfunding industry. NCFA Canada is community-based, membership-driven entity that was formed at a grass-roots level to fill a national need in the market place. Members are industry stakeholders (portals, experts, service providers, and enablers), small businesses and entrepreneurs using crowdfunding to fund their initiatives, and investors seeking to connect with a dynamic and growing crowd. For more information please visit ncfacanada.org.